Here's something to look forward to. 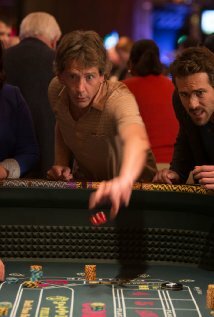 Last week a trailer for the upcoming movie Mississippi Grind (involving high-stakes tournament poker) was uploaded to youtube. The movie, which was shown for the first time at the Sundance Film Festival in January, is about a gambler, Gerry (Ben Mendelsohn), on a losing streak who teams up with a younger charismatic poker player, Curtis (Ryan Reynolds), in an attempt change his luck. The two hit the road together and travel from town to town, casino to casino with the vision of winning back what has been lost. Posted on Thursday, January 22, 2015 by "T". Mississippi Grind is the name of an upcoming gambling movie (involving high-stakes tournament poker) starring Ryan Reynolds and Ben Mendelsohn. The movie, which is written and directed by Anna Boden and Ryan Fleck, is about a gambler, Gerry (Ben Mendelsohn), on a losing streak who teams up with a younger charismatic poker player, Curtis (Ryan Reynolds), in an attempt change his luck. The two hit the road together and travel from town to town and casino to casino with the vision of winning back what has been lost.